Well, as we know, a year is a very long time in F1. Managing declines, or being asleep at the wheel, is not the Williams way, and the team following a reshuffle of staff and revision of its organisation bounced back in 2012. It claimed 76 points, rather dwarfing the 2011 total, and what do you know it even managed to win a race for the first time in way too long, Pastor Maldonado's tour de force at Barcelona taking the honours. As intimated this did not happen by chance. Following technical director Sam Michael and head of aero Jon Tomlinson handing in their notices shortly into the 2011 season in came Mike Coughlan as technical director, Mark Gillan as chief operations engineer and Jason Somerville as head of aero. And it wasn't simply a matter of changing the names on the office doors; there was root and branch reform of how the team did things. Before, while the team had good facilities in many areas, it seemed that Williams had not adapted to the demands of modern F1, with around 20 races a season most of which are outside Europe, and severe testing restrictions. There was a lack of control at the factory (it's not for nothing that Coughlan's role was factory-based largely in the early days) and the factory tail was wagging the race team dog, taking a scatter gun approach to producing new parts for the race team to use up its Friday practice running and also burden to it operationally, without much coherence or broad understanding of what the car needed. And the benefits of all this change transferred all the way to the lap times, and ensured a decisive Williams stride back in the right direction. If anything though there was some sense afterwards that 2012 could have delivered even more. In terms of car performance the Williams FW34 deserved to be at least one place (possibly more) higher than the eighth place the team ended up in the constructors' table. To some extent this was because the car was a bit inconsistent; rather sensitive to things like rubber debris. But mainly a lot of points were lost via the performances of the drivers. 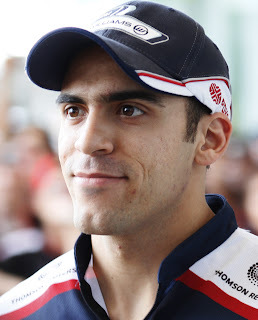 Pastor Maldonado was devastatingly quick, but prone to lapses which compromised results. Bruno Senna was safer, but lacked Maldonado's pace especially on a qualifying lap, which meant that points and the larger hauls of them were often out of his reach. And the team shows every sign that 2013 will contain continued progress for it. Many have feared the worst both at the team's late car launch (only Williams didn't have its 2013 car at the first pre-season test) as well as at the number of senior personnel who have left Williams over the last 12 months (Adam Parr and then Toto Wolff on the management side, Mark Gillan on the technical side), but the indications are that these will not hold the team back unduly. First of all, while Gillan made a big difference to the team when he arrived, the feeling grew as last season progressed that his presence was becoming obsolete. There still seems to be a Parr/Wolff shaped hole in the management just below Sir Frank Williams, but that will be filled in time presumably. 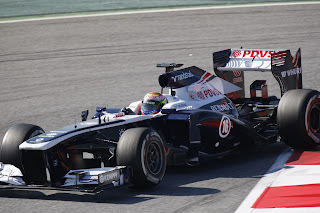 And more importantly the FW35 when it did launch had the look of a car that has made solid progress since last year. Many design details have been attended to, the car's rear end somehow looks even smaller than before, and the car features the innovation of 'blown wheel nuts' which channel air through the brake ducts (and unlike a similar Red Bull system from last season, they appear to be within the rules). And the machine showed no sign of suffering from its later introduction, running quickly and reliably in Barcelona testing. Many in the team sound confident of a step up. And in an age where many driver selections are based primarily on balancing of the books, the Grove team has taken a financial hit in replacing Bruno Senna with the highly promising talent of Valtteri Bottas - this can be interpreted as a statement of intent. Williams being the leaders of the midfield pack in 2013 doesn't seem at all fanciful. So, grand old Williams is not the new Tyrrell after all. And that is something for us all to be thankful for. It's fair to say that no driver in modern F1 polarises opinion quite like Pastor Maldonado. To some he is a rock ape, an on-track danger to others and himself, and only in the sport because of the PDVSA pot of gold he brings with him (which many quote as being worth £30m annually). And while it's undeniable that Pastor provides his detractors with plenty of ammunition, such a view is probably at the extreme end of the harshness scale. He is after all extremely quick, particularly on a qualifying lap, as he demonstrated last year by qualifying his car in the top three on no fewer than five separate occasions. And in ideal circumstances he can perform as well as anyone in the sport, as he showed in his flawless drive to victory in Barcelona last campaign. He also, less widely reported, has a rare touch on the gumball Pirelli tyres and ability to get them to last for longer. In a lot of ways he should be perfect for modern day F1. But as we know Pastor has a down side, namely his propensity for error and for red mist moments behind the wheel, which to be brutal the Barcelona win didn't test. Following his victory in mid-May Pastor, despite usually being competitive, didn't score again until October. In that period trouble was never far away it seemed, and several noses were put out of joint (both metaphorically and literally). However, following his nadir weekend in Spa, where he squeezed in a grid penalty, a jump start and hitting Timo Glock into no time at all, he appeared to start to pick his way out of the rubble and give the impression that he just might be learning from his misdemeanours. For the year's remainder much of the pace remained crucially (it's often the case that when calming down a fast but wild driver some of the pace goes at the same time) but he began to ally this pace with keeping his car away from others and from the scenery. And in this time he could well have finished on the podium in both Singapore and Abu Dhabi with mechanical reliability. Thus as we enter the 2013 season Pastor must show that he is continuing to learn and improve in this area. And his team clearly has faith - Williams has always loved an anti-hero, e.g. Montoya, Rosberg, Jones - and being the senior driver in the team may be the making of Pastor. Some remain to be convinced however, after all it won't be easy to unlearn deep-rooted instinctive responses, and crashing has peppered his repertoire since long before he reached F1. For these reasons his late-2012 upturn felt a lot more like the end of the beginning than the beginning of the end of this particular journey. But if Pastor can get indeed knock off the rough edges then it will be to all of our benefit, as we'll have an excellent F1 driver on our hands. Bottas. Probably the first debutant F1 driver to have his own Twitter hashtag. And his own cult hero status. But then again, Valtteri Bottas is no ordinary F1 debutant. Not by 2013 standards anyway. There will be five rookies on the grid at Melbourne (assuming no more unexpected shuffles at any rate), but of these Bottas seems to stand apart. While the rest to varying degrees owe their accession to money brought, Bottas even though he brings some cash of his own appears to have been selected on the basis of driving merit and potential. How Bottas does is one of the most eagerly awaiting conundrums of the 2013 F1 season. Of course, plenty of racers have arrived in F1 with glowing reputations only to do nothing at the sport's highest level to suggest why they deserved them, and that fate may befall Bottas. More immediately, he has the problem of not having raced since 2011, so he may show some rustiness in wheel-to-wheel combat in the early rounds. But the best evidence as things stand is that such problems should not impede him unduly. I can´t wait to see #BOTTAS take to the track in Melbourne with the FW35! I agree Chris, I think it looks like Williams will be best of the rest behind the 'big five' teams this year, the new car looks really good. And if everything comes together I also agree that another win can't be ruled out!